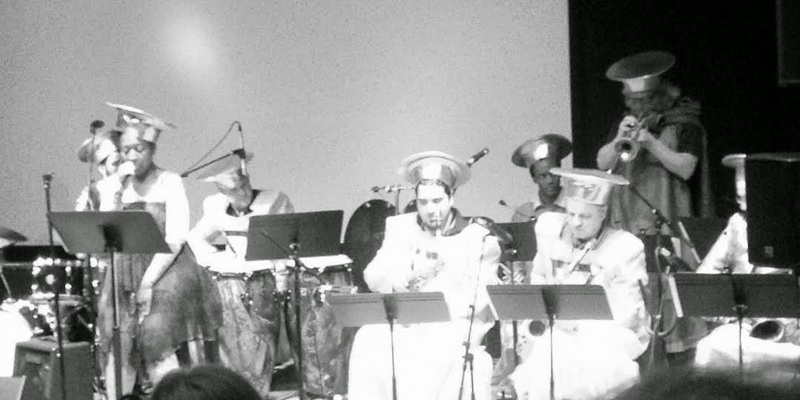 This Mother's Day, Sunday May 11th, I once again "traveled the spaceways" and ventured out to hear some Sun Ra music. Sun Ra was an influential jazz composer, bandleader, pianist, poet, philosopher...the list goes on. He has a very iconic sound, and was one of the most controversial jazz musicians- he claimed he was from Saturn for one. Sun Ra led his "Arkestra", and recorded many albums, with an ever-changing sound. Sun Ra was born 100 years ago on May 22, 1914- which means that this year celebrates what would have been his 100th birthday. This time in celebration I went to "Sun Ra's Centenary: Space is Still the Most Colorful Place" presented at the Boston Museum of Fine Arts Remis Auditorium. Notice the bright colors of the extravagant costumes! For this concert, Grammy nominated trumpeter Tim Hagans joined the New England Conservatory Jazz Studies Chair Ken Schaphorst, with a 10-piece ensemble of NEC students and faculty to play Sun Ra's music. In addition to the music, MFA Egypt expert Lawrence Berman presented a lecture connecting ancient Egypt archeology with Sun Ra's eclectic Egyptian inspired life. The concert started off with a lecture from MFA Egypt expert Lawrence Berman. Berman connected Egyptian archeology with Sun Ra's life, and found a parallel between Sun Ra's eccentric lifestyle and Egyptian kings. It was quite intriguing to hear how many of Sun Ra's messages actually came from ancient Egyptian spell books and other sources. 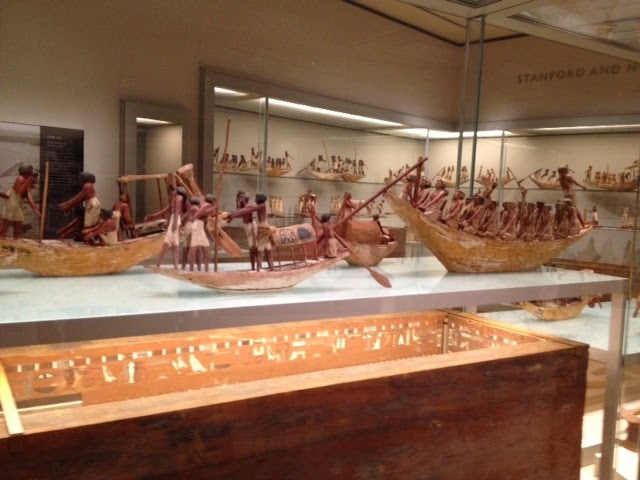 I learned that Egyptian kings would be buried in pyramids with many possessions, such as the boats featured in the picture to the right, in order to aid them in their venture to the sun to be with the Gods. 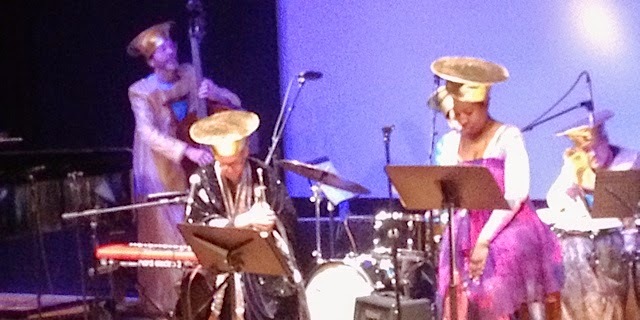 After Berman's lecture, the musicians came out with extravagant garbs, like how Egyptian kings would dress. The concert program consisted of We Travel the Spaceways, Call For All Demons, Enlightenment, an Egyptian Spell, Love in Outer Space, Saturn, and Space is the Place. Here's "Call for All Demons". I love the strong groove, and tight horn lines! What I love about Sun Ra's music is the fearlessness you hear in it- among the crazy costumes and eccentric references to outer space is a fearless, bold attitude in every song. Sun Ra's music allows the improvisers in the band to express their own individuality, ranging from harsh runs to subtle melodic ideas. Within each crafted song is room for each musician to be expressive, fearless, personal, and jubilant about the music and life itself! I loved each arrangement of Sun Ra's music today. Ken Schaphorst said that Sun Ra would perform many of the same songs throughout his career, but change them quite often. This element of change, taking a song and transforming it to be fresh, was apparent in the music today. Each arrangement highlighted the happiness and danceable qualities of Sun Ra's music. Here's "Love in Outer Space". I love the rise and fall of the melodic line within the lyrics- it's almost hypnotic! A definite highlight of the concert was the "Egyptian Spell", which was performed by vocalist Nedelka Prescod and the ensemble, and was later joined by Lawrence Berman. 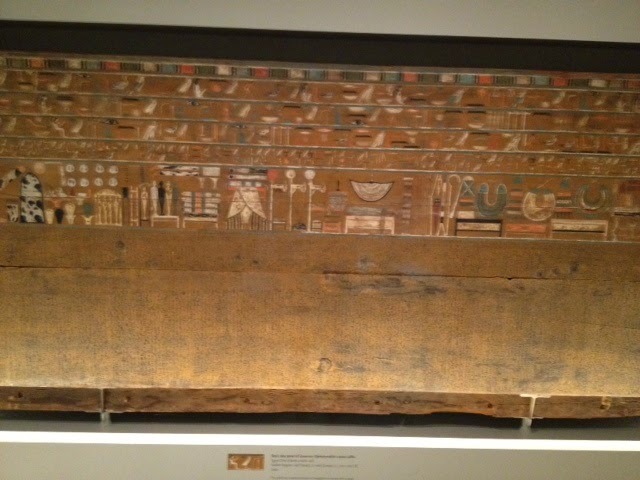 This piece was actually an excerpt from Pyramid Texts spell 222 as written in the pyramid of Kind Unis (2353-2323 BC) at Saqqara. The vocalist sang the translation of the text, and Berman joined the group to present a transliteration of the Egyptian text. It was quite exciting for me to see a man so enthusiastic about ancient Egyptian art, archeology, and culture! The concert ended with one of my favorites, "Space is the Place", which features a repetitive groove and lyrics: the phrase "Space is the Place" gets repeated many times creating a party-like atmosphere, with crashing percussion and bashing instrumental solos. Another thing I love about Sun Ra's music is, no matter how strange it gets, the central message to each song relates to peace, love, and even "Enlightenment"! The music is so full of a love for life- no matter what planet Sun Ra was from, he definitely had a great heart along with a crazy personality! Personally, I would not equate "Mother's Day" with "Sun Ra"- the leader, Ken Schaphorst admitted that even he was skeptical about blending the holiday with Sun Ra's music, yet it was a "Sunday", like "Sun Ra", and in addition it was a "sunny" day. However, no matter what day of the week it is or what weather it is, Sun Ra's music lends itself to an enormous amount of celebration and jubilation- perfect for a holiday or a trip to travel the spaceways! Check out my last Sun Ra blog!